At nineteen years old, just after my first year of college, I found myself in a classroom in a North Philadelphia elementary school, sitting in a circle with about 10 nine- and ten-year-old students, all of whom were Latinx or African American. Every day, we read books with Black and/or Latinx characters. Then we did activities about the books. In this room is where my desire to become an educator bloomed. Teaching, I discovered, was one of the hardest things I’d ever done. It required finding creative ways to hold students’ attention and helping them, at times, to break through their own insecurities about being able to learn. And I loved it. That summer I was a Servant Leader—a college intern—in the Children’s Defense Fund-sponsored Freedom Schools program. I continued to teach within this program for all three summers of college, and a few years later, I co-founded the first Children’s Defense Fund-sponsored Freedom School here in Durham, held at North Carolina Central University. What I loved about the Freedom Schools model was the culturally relevant books and the stories in them that we introduced to students. The aim was not to teach them to read per se, but rather to instill in our students a love of reading: a feeling that books were for them, that literary knowledge was theirs, that they could find themselves in the pages and use what they learned to make social change on various levels. I integrated this philosophy into my own teaching—in total I taught six years at the high school level and was a college instructor for one. I continually sought to expose my students to writers of color and marginalized histories. In the fall of 2014 a new opportunity presented itself. In my role as the Outreach Program Coordinator for the UNC-Duke Consortium based at the Duke Center for Latin American and Caribbean Studies, I received an email from Dr. Kia Caldwell, a Professor in the Department of African, African American and Diaspora Studies at UNC-Chapel Hill, stating that she was interested in starting a professional development program for teachers focused on the African diaspora. I shared her desire to expand K-12 students’ knowledge of Black histories, politics and cultures, including beyond the U.S. context. 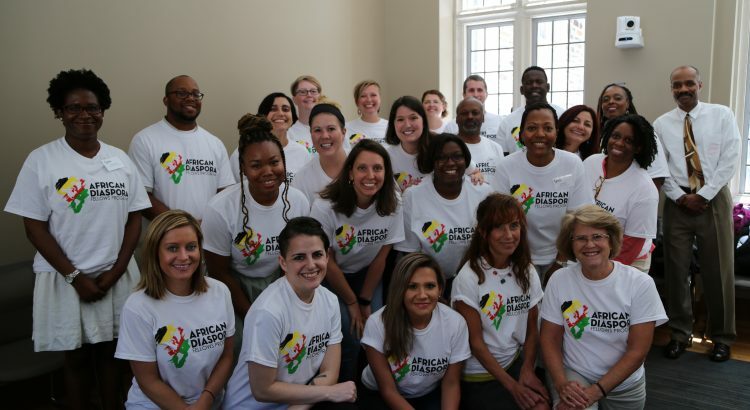 In partnership with Duke and UNC units, the local school district, and a state education agency, we founded the African Diaspora Fellows Program (ADFP), a professional development program for middle and high school social studies, English language arts, and world language teachers in African, African American, and Afro-Latin American studies. One of the most important lessons that emerged from ADFP is that critical pedagogy is necessary to incorporate a greater focus on content that deals explicitly with race, Blackness, and the experiences of people of color. To talk about race in the classroom and bring in, for example, a rich analysis of the Haitian Revolution and its impacts, or the movements for land rights in Colombia led by Black women, it becomes necessary to talk about power. It becomes necessary to interrupt traditional narratives that are based on the normalization of whiteness. After our two-and-a-half day summer workshop in 2015, we realized we must do more than simply to introduce our teacher participants to new content. During the 2016 summer institute, we devoted a full day to critical pedagogy. I believe in aspiring toward education as a healing space—one which aims at addressing the historical harms of racial oppression, class hierarchies, and other injustices, as well as a place where students, including all students of color, girls, trans, queer, disabled and differently abled students, poor students, and all young people can experience safety. As I write this, Dr. Caldwell and I are in the final stages of completing a co-edited book, Engaging the African Diaspora in K-12 Education, which is an extension of ADFP. We hope this text will be a resource for educators in bringing Black histories and communities from the margins to the center within many lessons and across disciplines. We also hope that this work will also bring attention to the oft overlooked Afro-Latin American population, who make up about 20-30% of all Latin Americans (de la Fuente, 2018), and to Afro-Latinxs, who make up 24% of the Latinx population in the U.S. (Pew Research Center, 2016). For Black students, Latinx students and all students of color, access to curriculum that reflects their identities, cultures, histories, and languages is important. I believe in aspiring toward education as a healing space—one which aims at addressing the historical harms of racial oppression, class hierarchies, and other injustices, as well as a place where students, including all students of color, girls, trans, queer, disabled and differently abled students, poor students, and all young people can experience safety. In order to do this, making shifts in what we teach as well as how we teach is critical. De La Fuente, Alejandro. “The Rise of Afro-Latin America.” ReVista (Cambridge) 17, no. 2 (2018): 2-8. López, Gustavo, and Ana Gonzalez-Barrera. “Afro-Latino: A deeply rooted identity among US Hispanics.” Pew Research Center, March 1 (2016). Article originally published on https://civic.duke.edu/2019/02/centering-black-latinx-and-poc-histories-communities-and-voices-in-education/.